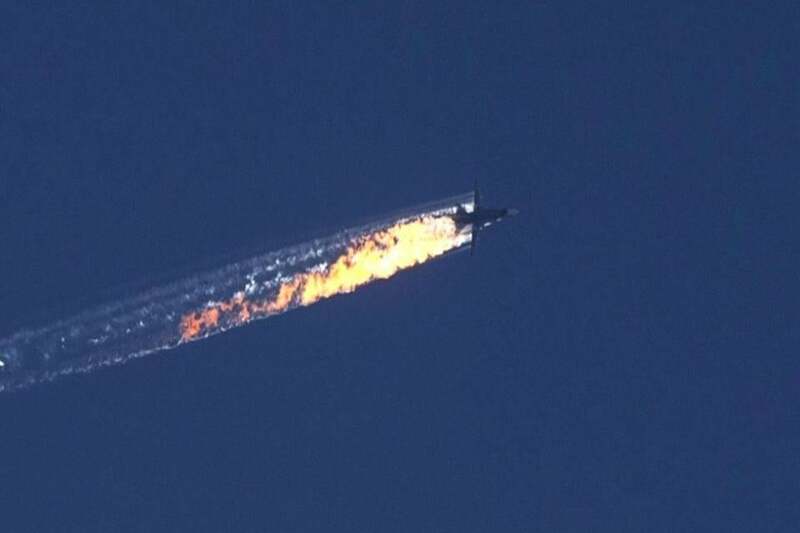 ANKARA, Turkey — Turkey on Tuesday shot down a Russian fighter plane it said had crossed into its territory from Syria, killing at least one of the two pilots, and marking the first time in half a century that a NATO member has downed a Russian plane. The long-feared incident further highlighted the complexity of Syria’s civil war and immediately prompted fierce reactions from Moscow. Russian President Vladimir Putin called Turkey’s action a “stab in the back by the terrorists’ accomplices” and warned of “significant consequences,” while Russian Foreign Minister Sergey Lavrov cancelled a visit to Turkey which had been planned for Wednesday. At Turkey’s request, NATO’s governing body opened an extraordinary meeting in Brussels. Turkey said the Su-24 ignored several warnings that it was nearing, and then intruding into, Turkish airspace. Russia insisted the plane stayed over Syria, where it was supporting ground action by Syrian troops against Syrian rebels. 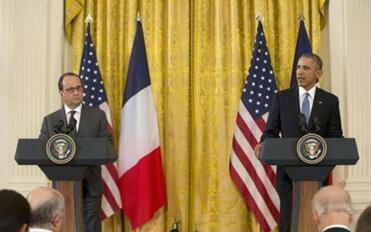 “We will win, and groups like [ISIS] will lose,” President Obama said in a press conference with the French president. Rebel forces fired at the two parachuting pilots as they descended, and one died, said Jahed Ahmad, a spokesman for the 10th Coast Division rebel group. The fate of the second pilot was not immediately known. Turkey and Russia have long been at odds over the crisis in Syria, where Turkey has been seeking the ouster of President Basher Assad, an important Russian ally. Turkey has also voiced concerned over Russia’s bombing of Turkmen areas in Syria and the fact that the Russian operations have complicated the possibility of creating a safe zone in northern Syria to protect civilians as well as moderate rebels fighting Assad. The creation of a safe zone has been a long-term Turkish goal. “We will never tolerate such atrocities as happened today and we hope that the international community will find the strength to join forces and fight this evil,” Putin said. But despite the harsh words, some analysts believe that Russia and Turkey have reasons not to let the incident escalate. ‘‘Relations have been very strained between Russia and Turkey of late so Moscow will be trying its utmost to contain the damage this might cause,’’ said Natasha Kuhrt, lecturer in International Peace and Security at King’s College London. “It’s a serious incident in anybody’s book,” added Ian Kearns, director of the European Leadership Network, a London think-tank. But Kearns said the Russian-Turkish economic relationship, including in the energy field, is important to Moscow. And Russia and the West appeared to be moving toward an understanding of their common strategic interest in eradicating the Islamic State group following the bombing of a Russian airliner over Sinai on Oct. 31 and the Nov. 13 attacks in Paris. The Turkish Foreign Ministry briefed diplomats from the five U.N. Security Council member countries on the incident. Separately, a Russian diplomat was also summoned for a meeting during which Turkey ‘‘conveyed its sensitivities’’ over border violations. A Turkish military statement said the Russian plane entered Turkish airspace over the town of Yayladagi, in Hatay province. Turkish officials released what they said was the radar image of the path the Russian plane took, showing it flying across a stretch of Turkish territory in the country’s southern-most tip. The Russian plane was supporting Syrian troops which have been on the offensive in an area controlled by several insurgent groups including al-Qaida’s branch in Syria, the Nusra Front, and the 2nd Coastal Division and the 10th Coast Division that include local Turkmen fighters. Turkey, which has vowed to support the Syrian Turkmen, has complained repeatedly that Russian planes supporting Assad are straying across the border. On Friday, Turkey summoned the Russian ambassador demanding that Russia stop operations in the Turkmen region. Last month, Turkish jets shot down an unidentified drone that it said had violated Turkey’s airspace. The country changed its rules of engagement a few years ago after Syria shot down a Turkish plane. According to the new rules, Turkey said it would consider all ‘‘elements’’ approaching from Syria an enemy threat and would act accordingly. Other countries have also complained recently that Russian military aircraft have markedly increased flights close to their airspace since 2014, when relations between Russia and the West significantly deteriorated amid the Ukraine crisis. NATO said there was a 50-percent increase in 2014 in the number of times its member nations intercepted military aircraft flying near its borders, but there was no immediate tally of how many of those incidents involved Russian aircraft. This year, Canada, Denmark, Lithuania, Estonia and Britain have all reported interceptions of Russian aircraft, as has non-alliance-member Sweden. The United States in turn complained of Russian aircraft intercepting one of its reconnaissance planes. Sarah Lain, an analyst at the Royal United Services Institute, said the last time she could remember a NATO member country _the United States _ shooting down a Russian/Soviet plane was the 1950s. “But the Soviets appear to have shot down more U.S. planes amid the Cold War,” she added. A still image made available on by the HaberTurk TV Channel showed a burning trail as a plane came down after being shot near the Turkish-Syrian border on Tuesday. Vasilyeva reported from Moscow. Bassem Mroue in Beirut and John-Thor Dahlburg in Brussels contributed.